Black and merry might sound a bit weird together but it’s the truth. 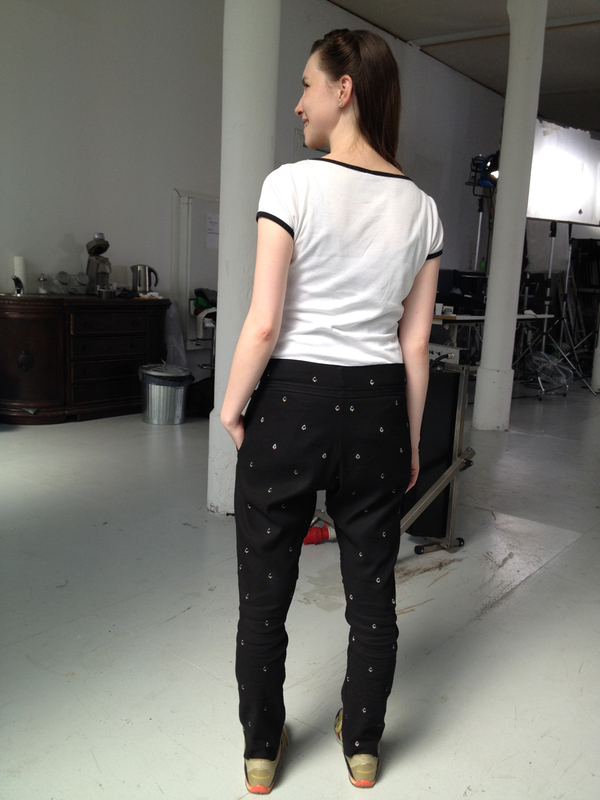 These pants are black and I am merry… and the pattern is called ‘Merry Melon’. It’s another make from my beloved CUT magazine (No. 13). Everytime I get a new issue I browse through it and want to make almost every pattern (there are just about 3 patterns per issue… but over time that sums up). I like the mix of simple silhouettes and special details. This time I was sold on the darts that transform into pleats. You might ask yourself ‘what is she talking about?’ I confess that black fabrics are not very photo-friendly when it comes to showing details. And the fabric isn’t even plain black. It has a subtle Paisley pattern (Did I mention that I went to university in Paisley (Scotland) one summer… my campus was right across the street of the museum where they show the history of this pattern… but it seems that nobody there cares much about that famous pattern… ) So I tried my best to create some enlighting detail shots. 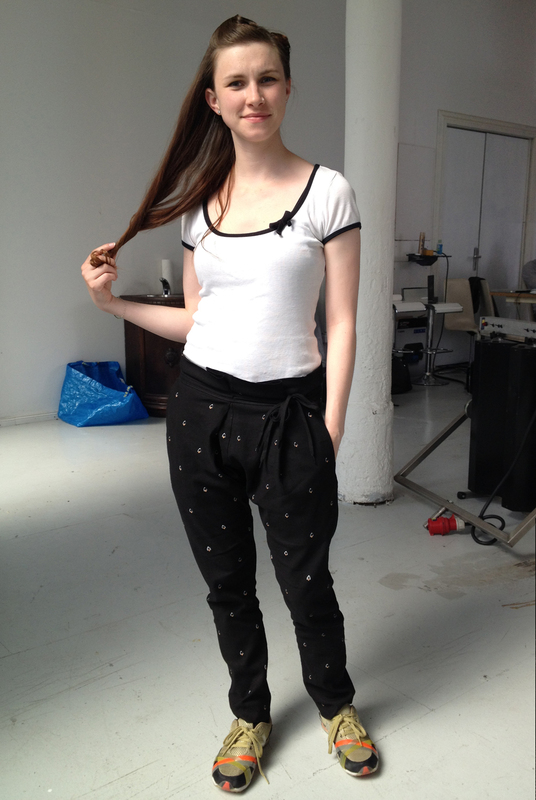 As you can see in this picture from the magazin, these pants are supposed to be ankle length. I don’t know if a dwarf like me could wear this length. (My culottes were a similar case…I just left them long.) But this circumstance saved me from having to shorten the legs, as I have to with every normal length pants. I wore these pants a lot. They are very very comfy. 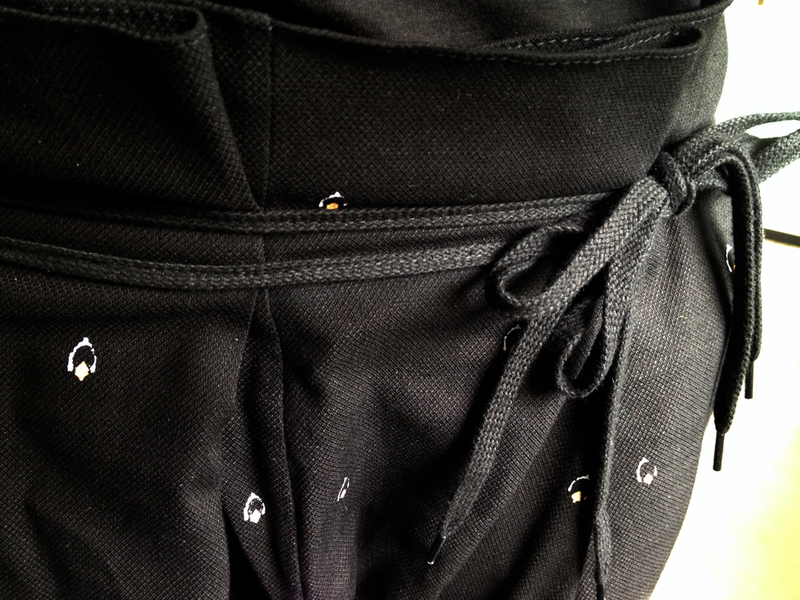 There is no zipper behind the flap. You can just slip them over because of the elastic in the back. It didn’t take me a lot of patience to do these pants. But you had to have quite a lot of it until you could read something new from me. 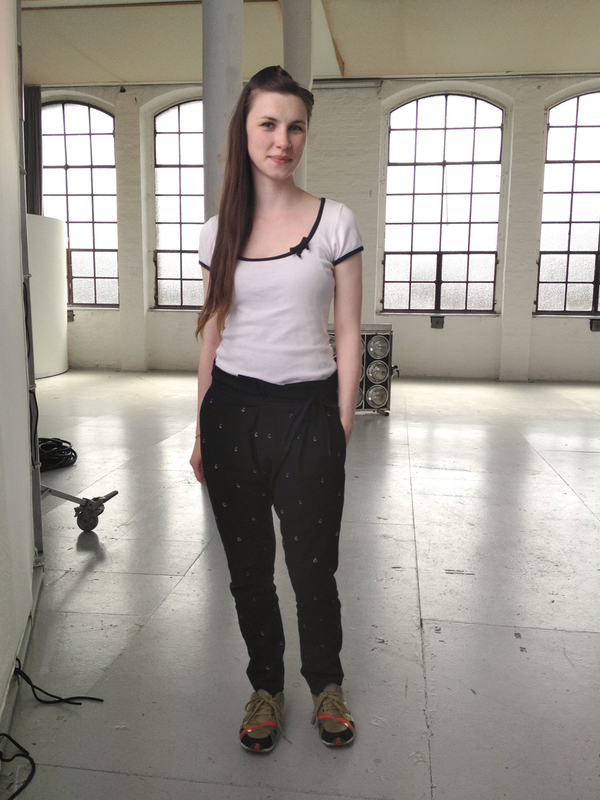 My most recent pants are from Burda 6991. This is a very easy pattern. The only challenge is to choose the right size. According to my measurements I had to make a 36. This is size S which is usually to big for me and I read that these pants are huge in the waist. Finally I decided to make size 34 (XS). The only alterations were to shorten the legs (about 10cm) and to move one side of the closure some centimetres closer to the outer seam. So I could tie it tighter. The recommended closure ist a stripe of leather or ribbon. Since I used some casual mystery fabric I imagined some so called ‘fat laces’ for this purpose. Back in the days I wore my sneakers with them. Well it seems they are out of fashion now. I couldn’t find them in any store. So instead I used two regular laces. Somedays after I finished these pants we shot a fitness DVD and I thought the set might be a nice backdrop for sportive pants. You can never have to many bows in one outfit 🙂 I didn’t wear my bow earrings so there are only 4 bows this time. These pants weren’t the first I’ve ever made. My first pair was ‘Vilma’. My friend gave me some issues of the german sewing magazine CUT for christmas. These pants seemed to be simple (I never did pants before). I bought very cheap fabric and some elastic band to try it. I made it a bit smaller than the smallest size and had to take it in at the thighs. I also added two pleats in the back and sewed them in place to reduce the paper bag effect. I added inseam pockets and lining at the hem to have another colour when I turn it up. Although the fabric was cheap it has a nice soft touch and is comfortable but a little bit to sturdy.